Here are some gentle ways to help your child sleep through the night without crying it out. When parents hear of sleep training, they think of the cry it-out method but that’s not the only, or best solutions to help your baby sleep through the night. These alternatives to crying it out will indeed help your baby learn to sleep through the night on their own (when they are ready) without closing the door and listening to them scream for hours. With our third child Taylor, I made the decision to not use any crying it out method for a few reasons. I will be upfront with you… we did use a limited cry-it-out method with our twins. They were eating very well during the day and sleeping great at naps, but because the night feeding had turned into a fun time to see Mom and Dad and was no longer from true hunger, we used a limited cry-it-out method to break the habit. The limited cry it out method didn’t include extended periods of crying (hence the name “limited”) but did break the habit of waking up just for fun, since the cycle wasn’t going away on it’s own. We practiced letting them sleep for 2 minutes, 3 minutes, 4 minutes and 5 minutes at a time, that was it. However, our third child, wasn’t sleeping through the night for a couple reasons. She just couldn’t catch a break or get the hang of night sleeping for the first nine months because of these road blocks and we decided when she was showing signs of being ready to finally sleep through the night, to use a gentle alternative to sleep training. There were times I was completely sleep deprived and exhausted and could have chosen to let her cry-it-out, but that wouldn’t have been the right fit for her (or me) and I knew we had to find a gentler alternative which fit our situation and her readiness. Deciding to use a no-cry method for sleep training, I found myself reading and doing a ton of research about cry it out alternatives. Sure, this gentle sleep method may have taken longer than one path we used for her brother and sister, but she’s an excellent sleeper now and goes to bed easily for nap and bedtime. 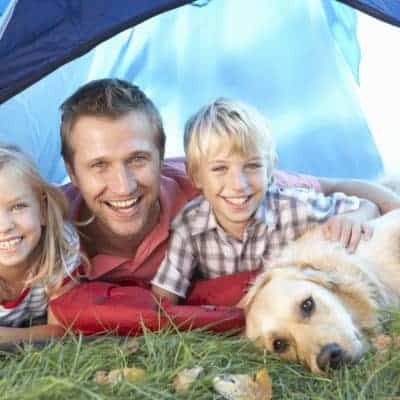 Each parent and each child has their own unique temperament, situation and needs. There are no fast fixes, but I firmly believe taking a gentle approach to sleep training will help your little one sleep through the night when they are developmentally ready. I cannot stress the importance of starting a routine early. Children are creatures of habit and a routine, even for babies, gives them comfort in knowing the expectations for each day. A child who feels safe because of their routine will much more easily follow the steps to bedtime, than a child without one. Establishing a wake up and set time your child goes to sleep every night can be difficult, but it’s key to your routine. If you don’t have a routine yet, begin with either the wake up time or bedtime and build your routine around this starting point. Consistently wake up your baby or put them to bed at the same time every day to begin your routine. 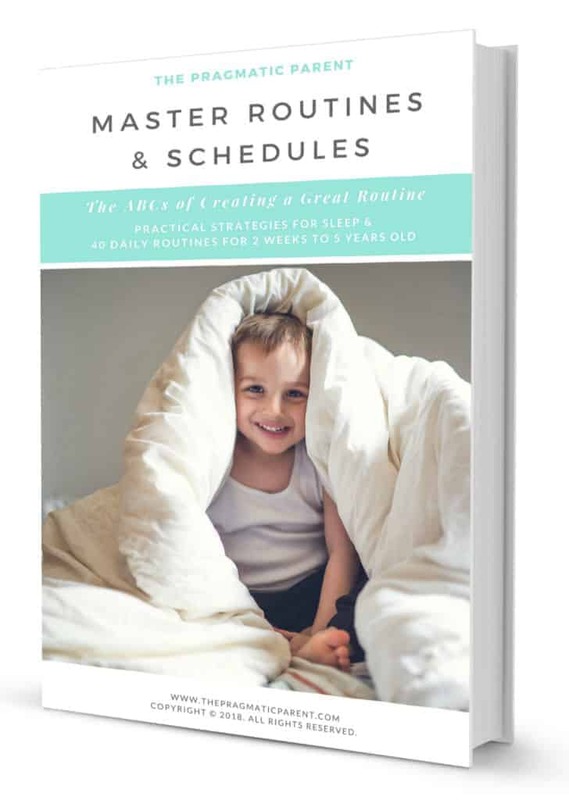 Use the Mastering Sleep & Schedules ebook to get started on creating a routine, or modifying the one you already use to make it even better. It may feel hard to make sure your child goes to bed at the same time every night, but it’s important to do so. Little bodies’ internal clocks, who are consistently put to bed at the same, will naturally adjust to bedtime and more easily settle into the bedtime routine. If you don’t have a routine and try to put your baby to sleep at random times every night, their bodies will never become trained for bedtime and you’ll make it even harder to try to get them to sleep consistently. 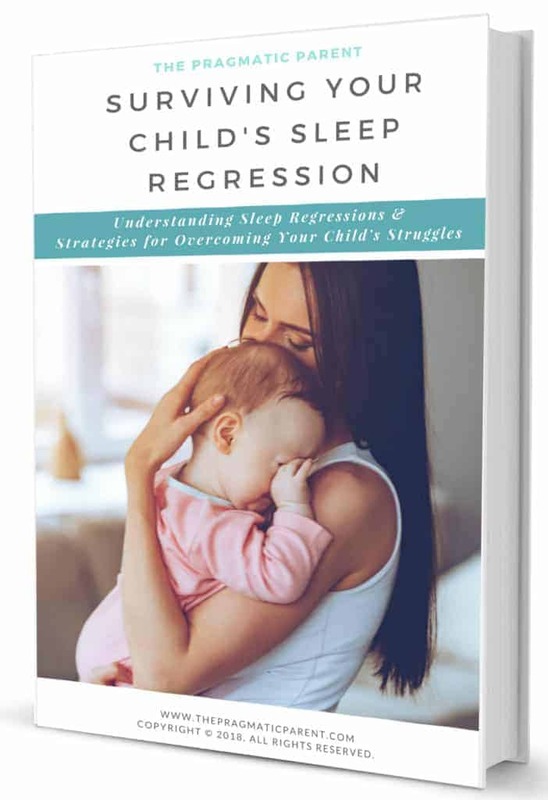 There will be times when illness, teething, sleep regressions (4 month sleep regression, 8-10 month sleep regression, 18 month sleep regression and two year old sleep regression), drop-ins, appointments and other conflicts will crop up and interrupt sleep. Don’t get frazzled, but just get back to your routine the next day or once your child is feeling better. Babies, whether it’s in the middle of the day or at night get overtired easily and once you get past this point, trying to get them to sleep will be that much harder. This is why it’s important to regularly nap at the same time(s) during the day, so falling asleep at night isn’t a battle. Also, some parents believe if their children don’t take a nap or stay up later, they’ll more easily fall asleep when it comes to bedtime. This couldn’t be further from the truth. Children who are overtired from not consistently napping, getting enough rest or staying up past the point of being overtired will also have more difficultly staying asleep at night. Watch for signals of your baby becoming tired such as cuddling, rubbing eyes, resting their head, patting your should when you hold your baby, etc. While your baby may not be able to verbalize her needs yet, reading body language will give you the telltale signs of when bedtime SHOULD be approaching. Watch for these signals when you create your routine or see timing needs to be adjusted. As an adult, I know I can’t fall asleep quickly if I workout before bedtime, watch a scary movie or drink any caffeine, so I avoid these stimulants. Children and babies also need a peaceful and calm bedtime routine which gives them enough time to wind down. Trying to put your baby to sleep after you’ve been playing and they’re worked up, will not go well. It’s hard to go from having fun to no-fun and bedtime. Before naptimes and bedtimes, take 15-30 minutes to help your baby wind down. It may mean sitting in a quiet place to read a book, snuggle, take a bath, dim the lights and listen to soft music. You can read more about creating a peaceful bedtime routine here. A lot of little kids find themselves naturally calmed with a soothing warm bath. If your child doesn’t mind bath time (because some do not like baths at all), aim to include this in your bedtime routine to help them sleep better. A gentle massage afterwards with lotion can also be soothing as long as your baby is dried off and not catching a chill. The American Academy of Pediatrics (AAP) recommends your child’s room should be kept at a temperature that is comfortable for a lightly clothed adult and the ideal temperate is 68 degrees Fahrenheit. 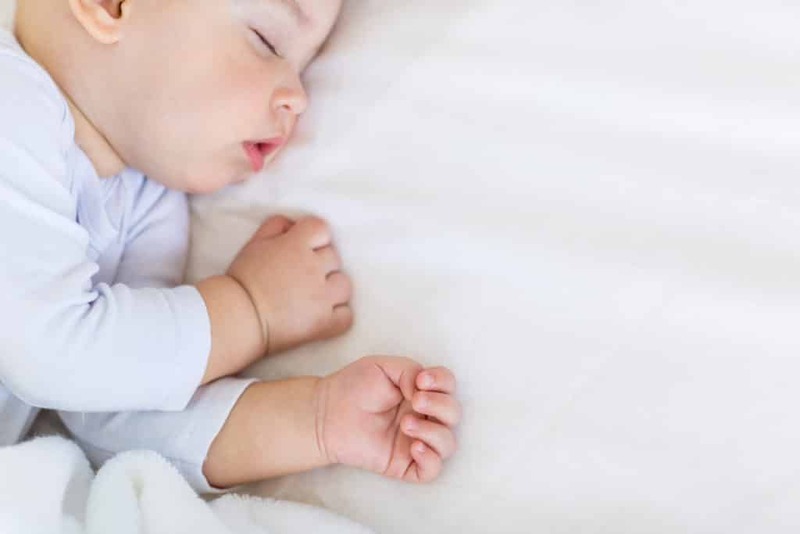 Often parents worry their baby will get cold overnight, but the AAP recommends a child’s room should be kept at a temperature where a lightly clothed adult would be comfortable. A cotton onesies or light pajamas in the summer a sleep sack in the winter are safe options. This temperature monitor with backlight for night will help you keep track of your baby’s room temperature so they don’t overheat, or temps aren’t too cold. What your baby sleeps in can make a tremendous difference for how well they sleep. For young babies, swaddling and flexible sleep sacks are always helpful. We LOVED the Love to Dream Swaddle Up with detachable arms which ares great for when your baby outgrows the MORO reflex and doesn’t wake themselves up with startling arm movements. It’s also lightweight enough for summer months and not restrictive. For swaddling we had great success with the muslin Aden and Anais swaddling blankets and I know with the twins, they preferred the SwaddleMe Swaddling Wraps with Velcro closures. 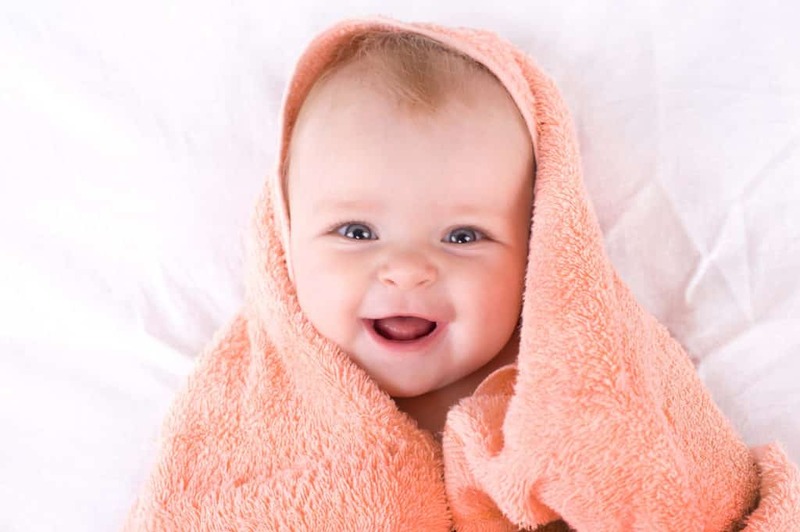 Swaddling generally stops around 3-4 moths, but because babies who are no longer swaddled are used to the sensation and comfort of swaddling, they still crave the feeling of being snug. The Baby Merlin’s Magic Sleepsuit is amazing for babies over 4 months and helps them sleep soundly. All the reviews rave about how great the sleepsuit works, especially during that transition of moving away from the swaddle. If you live in a colder climate, this Baby DeeDee sleep sack is almost like a baby sleeping bag to wear during naps and bedtimes. Put on a footed pair of pajamas and this sleep sack and you’re all set. Generally, I recommend parents stay away from microfleece because this can get a little too warm and not only does an overheated baby wake up more often, it’s also dangerous. I don’t recommend any sort of sleep training if your baby is still swaddled. You want them to have access to their fingers or a pacifier so they bring it to their mouths to soothe if they are upset. Sleep associations are habits, routines and things your child associations with their sleep – naptimes and bedtime. This can be nursing to sleep, being held in your arms while they fall asleep and other things like bath time, the phrase you use to say goodnight, a soft lullaby and more. Good sleep associations to make no cry it out sleep training easier, bad sleep associations will make sleep impossible! The difference here is that bad sleep associations keep your baby from sleeping on their own and good sleep associations are part of your routine and promote sleep. It key for your baby to know how to put themselves to sleep and back to sleep if they wake up from a sleep cycle. Always put your baby down in their crib drowsy, even if you rock or feed them. This helps train them to put themselves to sleep without your help. Bad sleep associations are created by consistently rocking or feeding your baby and putting your baby to bed asleep. If you do this enough, you train your baby to rely on you for sleep, instead of learning to do it themselves. The biggest sleep aid my children all used as babies and still use now, are white noise machines. Think of how noisy things were for your baby in the womb… a white noise machine does the same thing. It masks all outside noise and offers comfort for them to sleep and in the middle of the night, help soothe them back to sleep instead of lying awake listening to every outside noise such as honking cars or a passing siren. We really turned a corner with the twins when we started using a sound machine at 8 weeks – I’m not sure what we’d do without it now! The Hatch Baby Rest Nightlight is amazing, especially for older children who tend to wake up early and need help telling time. It’s a nightlight, sound machine and has a phone-programed “ok to rise” feature which gives the green light to get out of bed or start stirring. This last feature is great for older kids but the entire system can grow with your child from newborn through school-aged (and longer if you need.) This is the one item I recommend for every parent to have on hand! 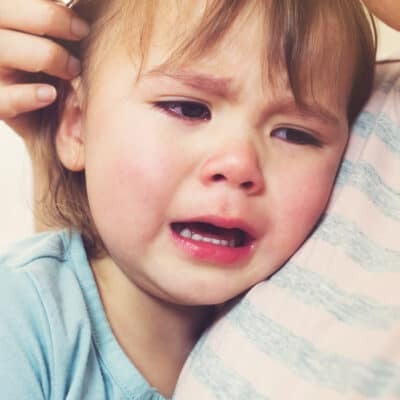 There are a couple things you can do when your baby wakes and cries, however because you know your baby best, go with your mother’s intuition on how you want to respond to your child. Go into his room, stand or sit by the crib and rub or pat his back to help soothe him back to sleep. Respond to his need (water, a Lovie, etc.) and tuck him back in and leave the room. It’s Ok if your baby is in hysterics to comfort them and hold them until they fall asleep, just try not to make this a habit. Whatever route you chose to go, keep stimulation, eye contact and light as limited as possible. Make sure your baby is in good health before you start any type of sleep training, whether you use a gentle no cry method or alternative sleep training. Behavior that’s cropped up recently such as sickness, possible ear infection, teething, reflux make it unfair to start any sleep training. If you have begun gentle sleep training, but your baby is inconsolable, won’t sleep and is fighting nap and bedtimes, please consult with your pediatrician. You never know if there is something going on you aren’t aware of. Ear infections are particularly hard to spot on some kids and you don’t know if he’s coming down with something, even though from the outside, he looks well. Before your baby can sleep through the night, they need to be developmentally ready and showing readiness signs they can make it 6-8 hours without eating. 6-8 hours? Yes, technically sleeping through the night is this length of time, especially the younger your child is. Figuring out the right time to sleep train is dependent upon a few factors including your baby’s development, current state of sleep, feeding, growth and your family’s schedule. There are signs your baby is ready to sleep train – signs they are ready to sleep through the night without any night feedings or waking, but also signs they aren’t ready just yet – even if you are. Here are the readiness signs your baby can sleep through the night and is ready for alternative no cry sleep training. Around 6 months is the general age most sleep experts agree you baby could be ready to master sleeping through the night. Be realistic with your expectations of when and how your baby can sleep through the night. If you chose to use the no cry it out sleep training alternative, please know this may take a few weeks of consistently sticking to your routine and nighttime practices. Timing is everything when it comes to sleep training because it’s a commitment your entire family will undertake. There is no exact timetable for how long sleep training will take as each child and each home is different, but committing to sticking to a routine each day and a method at night is important to your baby’s success at sleep training. There will also be the baby who sleeps great from the start and those who despite your best efforts, refuse to sleep until they’re older. Hang tight. Remember, this too shall pass. I know that’s easier said than done, but now that my babies all sleep through the night, there are times when I still miss those middle of the night snuggles and feeling needed, even if it was only to tuck them back in and kiss their sweet foreheads. Even though you may feel sleep deprived, this will be one of those times you miss. Thank you for this content 🙂 It’s a lot of knowledge right here. I would add to the list the book called „How to teach a baby to fall asleep alone” by Susan Urban. It is one of the gentlest methods I’ve found for sleep training you baby. I used it and it worked in just 4 rough (but not full of crying) nights! It is about routine and sleep associations too. What’s best – it works for nap times too!